Israeli soldiers shot, Wednesday, two young men, and caused dozens of Palestinians to suffer the effects of teargas inhalation, in addition to firing live rounds at reporters, after the army attacked protesters near the border fence east of Gaza city. Medical sources said the soldiers shot two young men with live fire, in their lower extremities, east of the Zeitoun neighborhood, southeast of Gaza city, before they were rushed to a local hospital. The soldiers were heavily deployed behind the border fence and fired many live rounds at Palestinian protesters. The soldiers also fired many live rounds at Palestinian reporters in the area, in addition to firing gas bombs and concussion grenades. 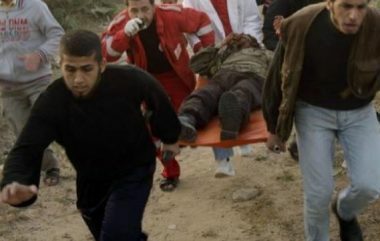 On Tuesday, the soldiers killed Ahmad Omar Arafa, 25, east of the al-Boreij refugee camp, in central Gaza.